In case you didn’t know, I’m a triplet, and my two siblings (both girls) are just as internationally mobile and passionate about travel as myself, with one sister spending her Erasmus year abroad in Rotterdam, and the other enjoying a semester in Budapest. Whilst I spent much of the previous summer in Hungary, I had not yet paid a visit to my other sister currently studying at the Erasmus University in Rotterdam, the business capital of the Netherlands and the hipper and shockingly overlooked cousin of the ‘Dam. So last weekend I decided to make the most of my surprise 4-day weekend and fly out to see her, spending my time at street food festivals, art galleries, beautiful parks and cosy Dutch pubs whilst enjoying the beautiful sunshine and uncharacteristic spring heatwave. 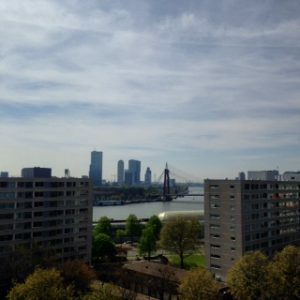 Whilst of course the city doesn’t quite have the high-energy nightlife and global cultural scene of Amsterdam, the residents of this somewhat gritty city often say “Amsterdam has it, Rotterdam doesn’t need it!” and I couldn’t agree more. What Rotterdam lacks in quantity it makes up for in quality, which a massively vibrant art and food scene, and much lower prices than the capital. This, along with the high quality of public services and an amazingly efficient transport network which Amsterdam is sorely lacking, has quickly cemented the city as my favourite spot in the Netherlands. If you happen to find yourself in the ‘Gateway to Europe’ anytime soon, I would recommend the Kunsthal and the Witte de Witt Museum for the best of local and national art, Tai Wu for affordable and delicious Chinese food, Kralingen and Slotlaan for serene strolls and beautiful architecture, and the De Witte Straat for a bustling and rowdy night out. Above all, it was nice to see my sister for the first time since Christmas, and see how her Erasmus experience has differed to my own (I would definitely call it more quiet, but wonderful all the same). This will probably be the last trip I take for a long time, and whilst I sometimes feel as though I haven’t travelled as much as my Erasmus counterparts, I haven’t really felt the need to, as I’m in a city that I adore, and can visit other European countries at any time.